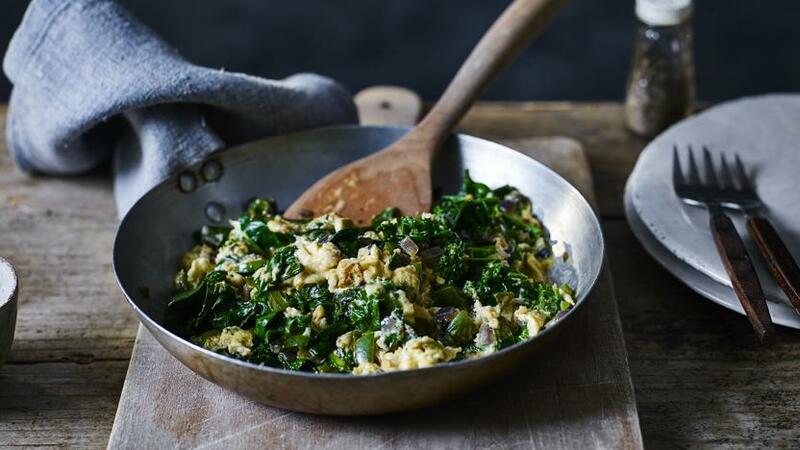 Use a light single cream alternative to make Tom Kerridge's scrambled eggs with kale extra creamy without the calories. Each serving provides 309 kcal, 21.5g protein, 8.5g carbohydrates (of which 6.5g sugars), 20g fat (of which 7.5g saturates), 4.5g fibre and 1.6g salt. Beat together the eggs, cream alternative, salt and pepper. Add six sprays of oil to a large non-stick frying pan over a medium heat. Add the onion and green pepper and cook for 3–4 minutes, or until slightly softened. Add the kale with a dash of water and cook for 2 minutes. Sprinkle over the Cajun spice mix, a pinch of salt and the spinach. Cook, stirring, for 1 minute or until the spinach has wilted. Add another 6 sprays of oil to the pan. Pour in the egg mixture and let it set for a few seconds, then gently stir until scrambled and just cooked. You want them soft and silky, so be careful not to overcook. Spoon onto warmed plates and serve. If you like it extra spicy, add a dash of hot sauce before serving.